For decades, the Pittsburgh region has been a haven for refugees fleeing violence and oppression in their home countries. Refugee families, children and individuals have put down roots in southwestern Pennsylvania with the help of local resettlement agencies, religious organizations and nondenominational groups. Today, our region is dotted with vibrant communities of hard-working Bhutanese, Bosnian, Burmese, Congolese, Iraqi, Somali, Sudanese and Syrian refugees, among others. While adapting to a new home with different languages and customs is difficult even in the best of circumstances, refugees positively contribute to the Pittsburgh community in a variety of ways. On June 17, Pittsburgh’s World Refugee Day in Market Square celebrated those contributions with musical and dance performances, as well as “Refugee Voices” presentations and food and fares from the local communities. Who are refugees? A refugee is someone who has been forced to flee his or her country because of persecution, war or violence. While returning home is often a goal, many refugees spend years in temporary camps in third countries before either returning home or being approved for resettlement in an adopted country. Their plight has been brought to wider public attention over the past year as conflict in Syria and ongoing violence around the world has forced more than 15 million people to flee their country of origin. The United Nations’ Refugee Agency calls this the worst refugee crisis since World War II. Through it all, Pittsburgh has remained a welcoming city. Thanks to the tireless efforts of various organizations, our region continues to help more than 500 refugees create homes here each year. The U.S. refugee process is grueling and typically takes years. Refugees remain among the most highly vetted population to enter our country, undergoing screenings by the Department of Homeland Security, the FBI and one-on-one interviews abroad before they may be approved to enter the United States. For more information or to help refugees in the Pittsburgh region, contact a local refugee resettlement agency such as AJAPO, Catholic Charities, Jewish Family & Children’s Services or the Northern Area Multi-Service Center. Posted in Brookline, Changing Demographics, diversity, Family Focused, Global Citizen, international, Neighborhoods, women. PITT OHIO was ranked the No. 1 place to work among large Pittsburgh region companies (more than 400 employees), while CEO Charles “Chuck” Hammel was named top leader in the large-company category for the second time. The Post-Gazette’s survey partner, WorkplaceDynamics, invited 1,401 Pittsburgh area companies to participate and received completed, confidential surveys from nearly 16,000 employees at 126 organizations. The survey’s 22 questions measured seven factors, three of which addressed how they feel about their day-to-day job. The Strip District-based trucking company was founded in 1979, specializing in hauling less than full truckloads of goods across the Mid-Atlantic and Midwest. It has since expanded to handling supply chain needs of other businesses and delivering packages across North America, employing 567 people across the Pittsburgh region. PITT OHIO has several immediate openings for commercial truck drivers – the most in-demand job in the Pittsburgh region – as well as for mechanics and dockworkers. It is also seeking business system analysts and other office-based jobs, and offers internships with hands-on experience in a range of jobs across the company. Its postings listings tout competitive wages and 100 percent employer-paid medical insurance. Overall in the Pittsburgh region, employees surveyed indicated that organization health was the most important issue for them. Pay and benefits were lowest among the seven factors. WorkplaceDynamics’ website called that unsurprising: “Time and time again, [our] research has shown paying more money does not make a bad workplace better. You can learn more about WorkplaceDynamics methodology and findings here, and read the Pittsburgh-related results here. Posted in careers, Changing Demographics, Experienced Professional, Family Focused, Manufacturing, Strip District, Transportation, veterans, Young Professional. The City of Pittsburgh will co-host two naturalization ceremonies at noon on Monday, Oct. 26 and Tuesday, Oct. 27 in partnership City of Asylum, Pittsburgh Parks Conservancy, and U.S. Citizenship and Immigration Services Pittsburgh Field Office. Nearly 60 new Americans will receive their citizenship at the ceremonies. University of Pittsburgh Chancellor Patrick Gallagher and Carnegie Mellon University President Subra Suresh will deliver keynote remarks at Monday’s ceremony in Schenley Plaza. Tuesday’s ceremony at City of Asylum will include remarks from City of Asylum President and Co-Founder Ralph Henry Reese and Kheir Mugwaneza, director of Community Assistance and Refugee Resettlement at Northern Area Multi-Service Center, the largest refugee resettlement agency in the Pittsburgh metro area. These public ceremonies underscore Peduto’s aim of bringing residents and leaders together to celebrate neighbors as they make their final step on the path to citizenship. Learn more about the city of Pittsburgh’s welcoming initiative here. Posted in Changing Demographics, City Centric, diversity, Experienced Professional, Family Focused. On Sept. 17, 2004, Jim Riley and his employees watched helplessly from the roof of his All Pro Painting business on West Main Street as Hurricane Ivan pounded the community of Carnegie and the rising waters of the Chartiers Creek swamped his business. Dozens of stores and homes and even the fire department were severely flooded. The damage was swift and devastating and some businesses never recovered. Riley, now 56, was rescued along with his employees that day and he rebuilt his company in the years that followed. By 2012 not only had other businesses ruined by Ivan been revamped and reopened, but many new ones cropped up. The turnaround was so impressive that Riley decided to invest again in the future of Carnegie, and he and his wife bought the longstanding Paddy’s Pour House and remodeled and launched it as Riley’s Pour House. Then they sold their house in Mt. Lebanon and moved in above the pub. Ten years after the flood left many in the town of nearly 8,000 looking for opportunities elsewhere, Carnegie is seeing a revitalization in the form of much-needed commerce and foot traffic. 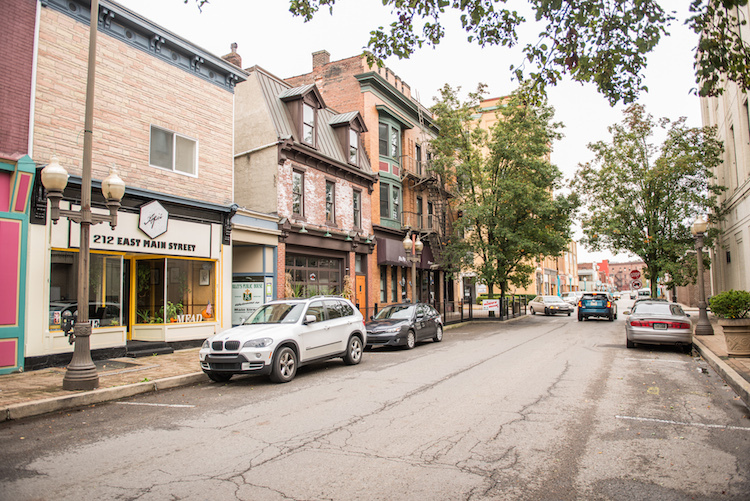 The charming and walkable Main St. is lined with a variety of independent businesses, from antique stores to the new Apis Mead & Winery, offering six varieties of the honey-based wine and One Thirty One East, a world fusion restaurant. In the heart of the borough is the historic and beautiful Carnegie Library, lovingly restored years ago. The 1.6 square mile neighborhood has what you would call good bones. Hans Gruenert at Off the Wall Theater. Photo by Rob Larson. Gruenert originally owned a theater in the city of Washington 30 miles to the south, but started looking for a new location in 2012. “When we saw that community was not taking strides forward, we started looking around and we loved what we were seeing in Carnegie,” Gruenert says. Apparently it was a good decision. The theater, which offers cabaret, modern dance, theater performances and special events including comedy acts, is booked solid until June 2015, he adds. Destination restaurants such as Papa J’s, a stylish and popular mainstay which was forced to renovate after the flood, came back better than ever. And new businesses came in, such as a much needed coffee shop. 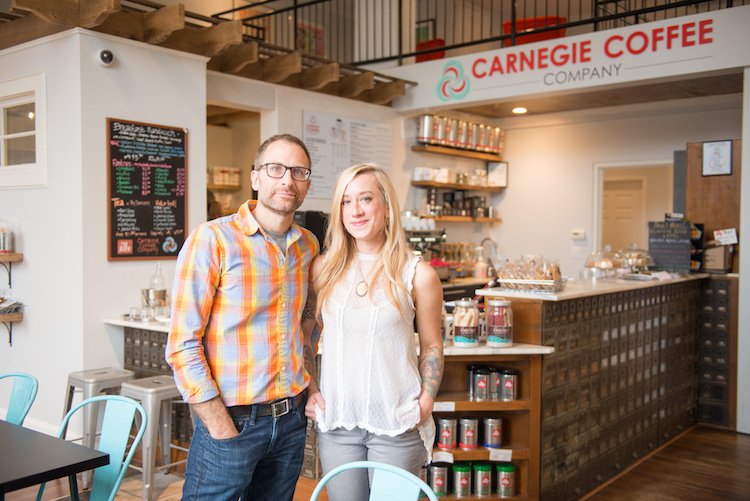 Ashley Comer and her husband, Greg Romeo, already owned a pharmacy in Carnegie when the Shadyside couple decided to renovate the former town Post Office on Main Street and open the Carnegie Coffee Company in June 2013. Hurricane Ivan destroyed the only other pharmacy in Carnegie, Comer says, and Romeo’s business grew exponentially. When the couple decided to renovate the former Post Office, they opted to locate both their businesses there. The historic and now charming building features a mezzanine level and the original windows and antique mailboxes. In just over a year, the coffee house has expanded its offerings to include breakfast sandwiches and lunch items and the parents of three are eager to see their business continue to grow. They juggle the businesses with raising three children, ages 3 to 14, and Comer says most weeks they spend more time in Carnegie than Shadyside. 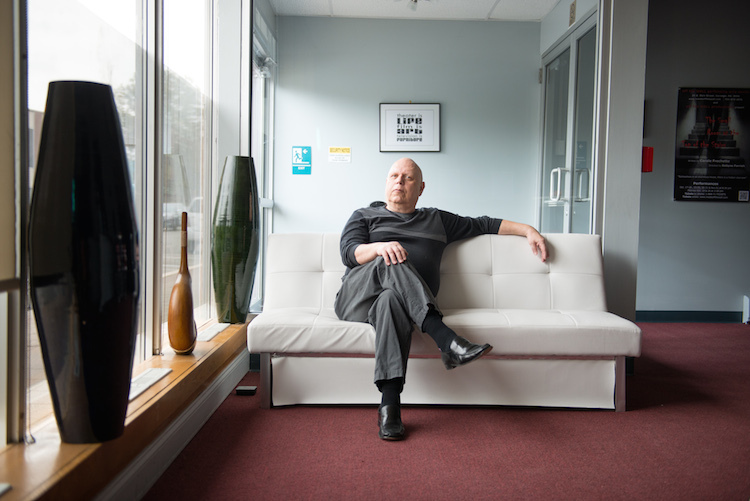 When Jeff Krakoff decided to relaunch his public relations and marketing/communications firm, he looked at several locations before settling on Carnegie, located 5 miles from downtown Pittsburgh and less than 20 minutes from the airport. After purchasing the former Paddy’s Pour House in late 2011, Jim Riley and his wife spent months cleaning, painting and remodeling the building that had been a drinking establishment of some sort since 1936. In 1979, a man named Dennis Murphy purchased it and turned it into an Irish pub, which it remained for the next three decades. Riley revamped the menu with fresh offerings from local vendors, brought in live music during the lunch hour and evenings and turned a back wall of the pub into a “Legacy Wall,” featuring the names of the previous owners of the building and the dates they owned it. Looking for a job? ImaginePittsburgh.com‘s got ‘em — more than 20,000 open positions on our powerful, 10-county job search aggregator, updated nightly. Posted in Arts & Culture, Entrepreneur, Family Focused, Young Professional. We’re fortunate in Pittsburgh to experience the beauty of all four seasons and October exemplifies the best of autumn. The leaves twirl from the trees, pumpkins are ready to be carved and we can finally enjoy the Halloween candy that has teased us from store shelves since August. This month in our guide to the Top Family Adventures in October, you’ll find superheroes, garden trains, wooden ships, science fun, fall festivities and more. Here’s hoping your Halloween tricks don’t outnumber your treats. Happy fall! Photo courtesy The Columbus Foundation. In the late 15th century, Christopher Columbus sailed across the Atlantic Ocean with hopes of discovering new lands. 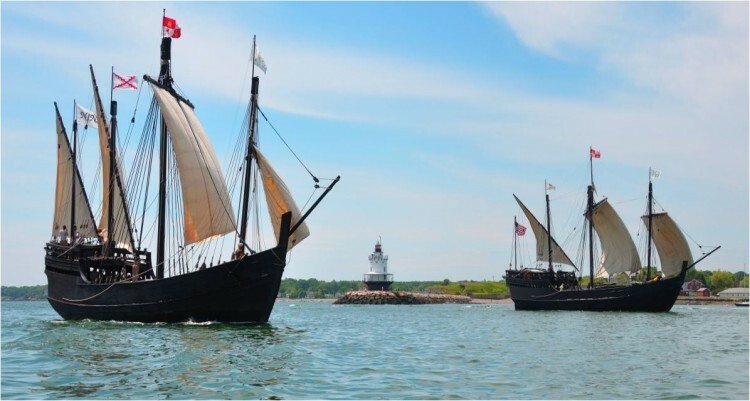 While opinions differ about his historical legacy, no one can deny that the opportunity to see replica ships of the Niña and the Pinta is an opportunity not to be missed. From October 1st – October 12th, the Columbus Foundation offers Pittsburghers the chance to step onboard these “floating museums” and learn about the type of ship (called a caravel) Columbus used to log thousands of miles in search of lands new to him. The Niña vessel on display is generally considered to be the most historically accurate Columbus replica ship ever built. Families can purchase tickets at the dock at Station Square for a self-guided tour of both ships. Highlights include seeing firsthand the design and materials used to craft the ship, educational exhibits about the building of the ship, how it was navigated and the history of the time period when it sailed. For more information about the replica ships, click here. If your family loves living history events, check out Fort Ligonier Days on October 9th – 11th. This festival commemorates the Battle of Fort Ligonier (fought in 1758), an important engagement during the French and Indian War. 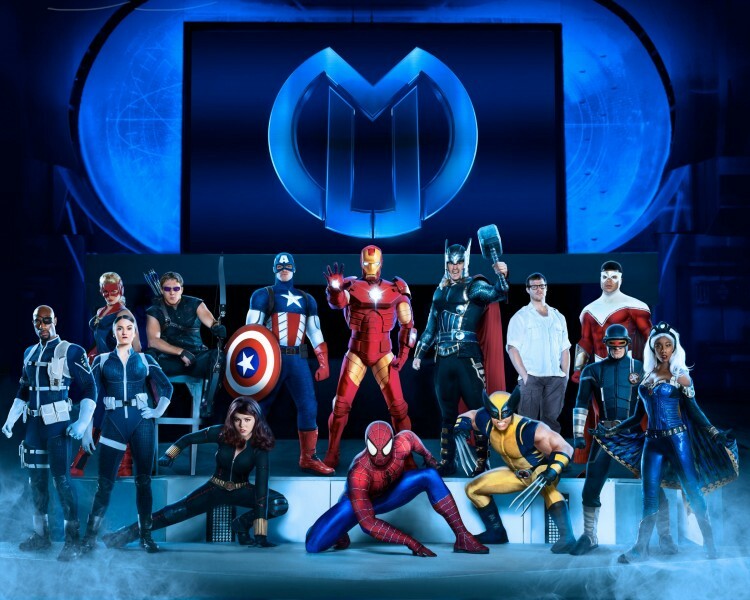 See your favorite superheroes at Marvel Universe LIVE! Who are your children’s favorite superheroes? Chances are very good that at least a few of them will be featured in Marvel Universe LIVE! at Consol Energy Center from October 8th – 11th. With over 25 Marvel characters represented, including Spider Man, Incredible Hulk, Captain America, Iron Man and Black Widow, this live show sets up a classic “good vs evil” theme as heroes battle villains for the powerful Cosmic Cube. Throughout the show, families can watch the Marvel characters perform all kinds of action-packed aerial stunts, motorcycle stunts and martial arts. A car chase will have kids on the edge of their seats while special effects and pyrotechnics keep the show’s intensity high. Make the event extra fun for kids—let them wear the costumes of their favorite characters. Find ticket information and showtimes here. Photo courtesy Maker Faire Pittsburgh. Join crafters, scientists, garage tinkerers, tech enthusiasts and like-minded DIYers at the Maker Faire Pittsburgh on October 10th and 11th. People of all ages and backgrounds are welcome at this family-friendly event highlighting invention, resourcefulness and creativity. Get ready to learn and be inspired by over 50 tech exhibits, ranging from 3-D printing to robotics, and more than 20 arts and crafts demonstrations including everything from glassmaking to Japanese painting. In between presentations and workshops, there will be time to enjoy a robotic petting zoo, live performances, a bite to eat from the food trucks and a stroll through 30+ vendors selling their creations. Proof that the planners thought of everything? There’s even a designated Quiet Space where Faire-goers can take a break from the sensory-rich activities. Wow! For more info. about this amazing community event, check out our article about how the Pittsburgh Maker Faire promises to be a game changer. All aboard! The Garden Railroad at Phipps Conservatory is back this year with a whimsical theme that children are going to love. 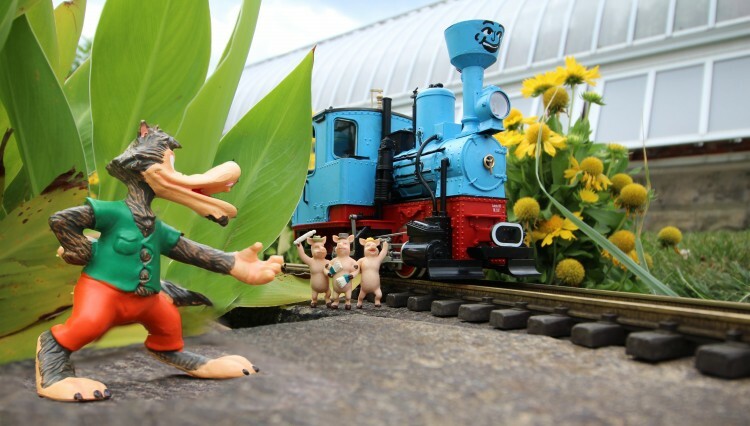 Opening on October 17th in conjunction with the Fall Flower Show, the Garden Railroad will take guests on an imaginative journey through scenes from classic tales such as Little Red Riding Hood, Jack and the Beanstalk and The Little Engine That Could. Thanks to interactive features engineered by staff members, visitors can make the railroad display come alive. For example, kids can push a button and make a crocodile follow Captain Hook’s ship around Neverland Island. Green thumbs will appreciate that all the plants and flowers surrounding the railroad are grown specifically to match the size of the trains and other features. While the Fall Flower Show will have a limited run through Sunday, November 8th, the Garden Railroad will be on display through February 28th. For hours and admission prices, click here. Photo courtesy Pittsburgh Zoo & PPG Aquarium. Looking for an alternative to neighborhood trick-or-treating? Just want to get more wear out of the Halloween costumes? 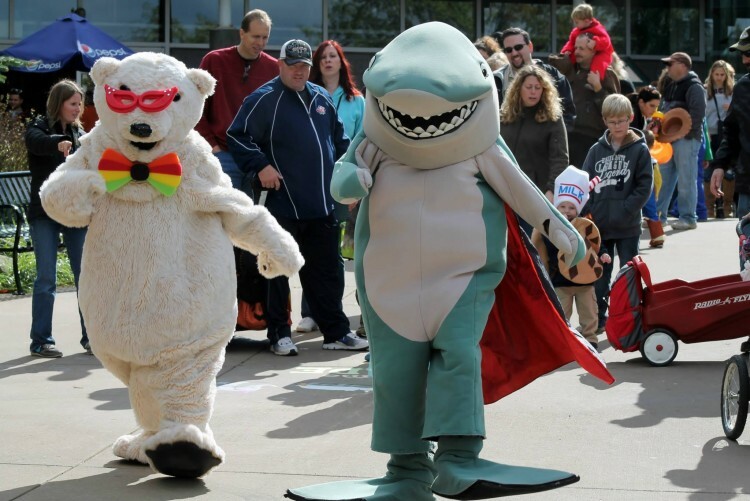 Head to the Pittsburgh Zoo & PPG Aquarium for its annual ZooBoo weekend events on October 17th and 18th and October 24th and 25th. Trick-or-treating stations will be set up throughout the zoo for candy giveaway and Halloween-themed games. The animals will join in the fun, too, with pumpkin treats and decorations. The Monster Mash area will have crafts, games, music and dancing. ZooBoo will feature two family-friendly haunted houses, one run by Gymkhana and the other by zoo volunteers. No worries about little ones getting frightened-these spaces are all about fun. Kids are encouraged to wear a Halloween costume. There will be a parade and costume contest. Please bring your own trick-or-treat bags. Can’t get enough of celebrating Halloween with animals? Check out the National Aviary’s Owl-o-ween events during October. Don’t forget to wear your costumes and take fun Halloween photos with different birds. Trick-or-Tweet! Photo courtesy of Venture Outdoors. Venture Outdoors is all about getting outside and being active. This fall, Venture Outdoors offers several activities perfect for families who want to combine the beauty of the season with some good exercise. On October 18th, kids can take a discovery walk in North Park and then decorate a pumpkin while munching on yummy snacks. For families who like a little bit of spookiness (but still family-friendly), try the Ghost Stories and Campfire Hike in Moon Park on October 24th. Roasted marshmallows included! Finally, have your younger kids wear their costumes for the Tyke Hikes Halloween Party in Schenley Park on October 31st. Trick-or-treating and crafts will take place after the hike. Photo courtesy John Altdorfer for Kelly Strayhorn Theater. 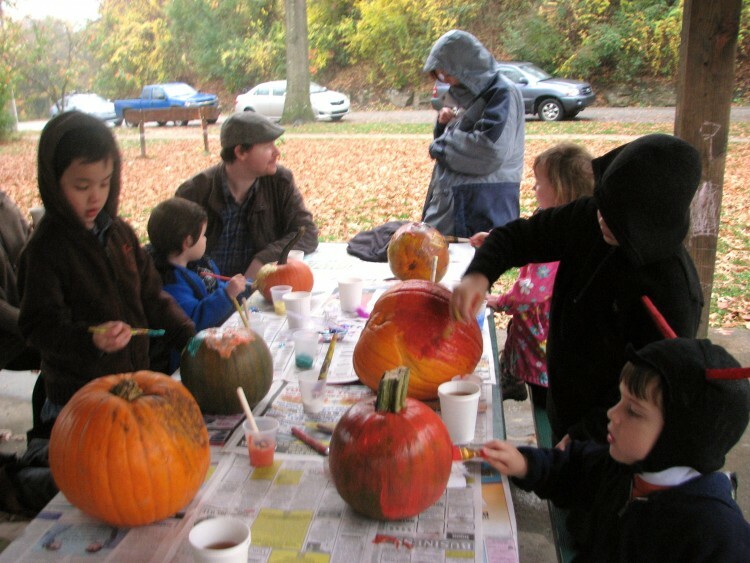 If you’re looking for a free fall activity with all the bells and whistles, head to South Parkfor Allegheny County’s Hay Day Celebrationon October 17th. Just like last month’s event at Hartwood Acres, this celebration will include pony rides, bounce houses, crafts, a trackless train, petting zoo, hay rides and more. Food trucks will offer lunch options for purchase. Hay Day is an affordable way for the whole family to welcome the fall season. 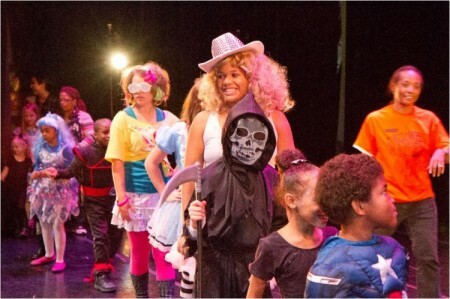 For a Halloween event that fits the whole family, try the 7th Annual Halloween Mayhem at Kelly Strayhorn Theater on October 24th. This spooky day of activities includes dance and music performances by local youth groups, a costume parade, puppets, refreshments, photo booth, face painting and activity stations run by community organizations. Lastly, find even more ways to enjoy the fall season in Kidsburgh’s 10 family-friendly farm adventures in Pittsburgh this fallarticle. October marks the opening of the Pittsburgh Cultural Trust’s 2015/2016 season of the Citizens Bank Children’s Theater Series. Showcasing imagination, creativity and fun, this family-friendly series features six shows with run times around one hour, making them ideal for introducing young children to theater. Specifically staged for children, the shows often include simple set designs, interactive elements and catchy songs. This season opens on October 18th with the show, Alexander, Who’s Not Not Not Not Not Not Going to Move, about a boy who doesn’t want to move when his dad gets a new job in another city. The season schedule includes more shows from popular books, including Junie B.’s Essential Survival Guide to School, Big Bad Wolf and the classic Goodnight Moon and Runaway Bunny. In addition to being affordably priced, these shows travel to multiple locations around the city making it super convenient to attend and usually free to park. Click here for more info about locations, ticket prices and show descriptions. 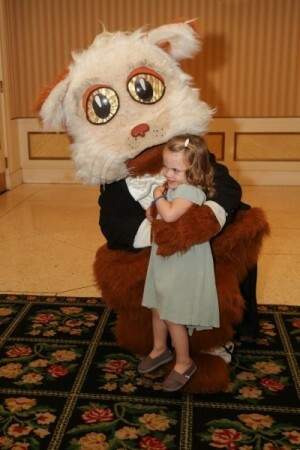 If you’d like to introduce your children to the symphony, check out the opening show of the Pittsburgh Symphony Orchestra’s Fiddlesticks Family Concert Series presented by Macy’s on October 24th. These three Saturday morning concerts last about 45 minutes and are perfect for children ages 3 to 8. Themes for the shows this season include Sing!, Dance! and Play!. Photo courtesy Carnegie Science Center. Imagine a cauldron of spooky liquid being stirred by a witch. Could she be a chemist? Sure, but chemistry is not limited to crazy mixtures in laboratory beakers and cauldrons. 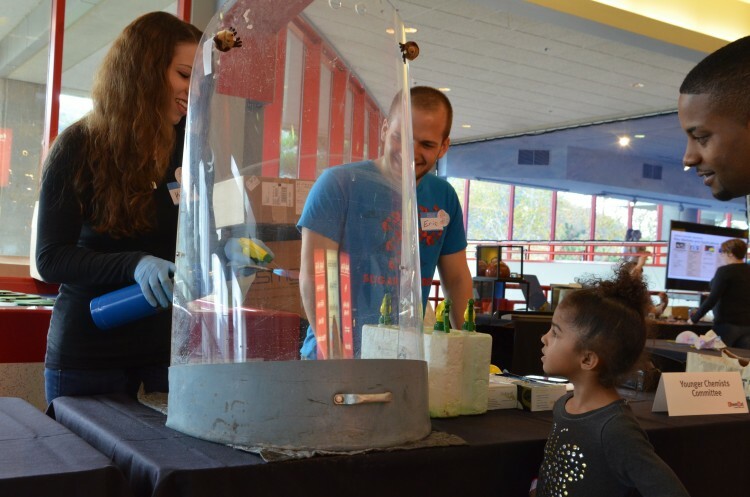 Find out how chemistry helps us learn about the world at the Carnegie Science Center’s ChemFest, a celebration of National Chemistry Week in partnership with the American Chemical Society. Free with admission, the Science Center will offer dozens of hands-on demonstrations and exhibits. 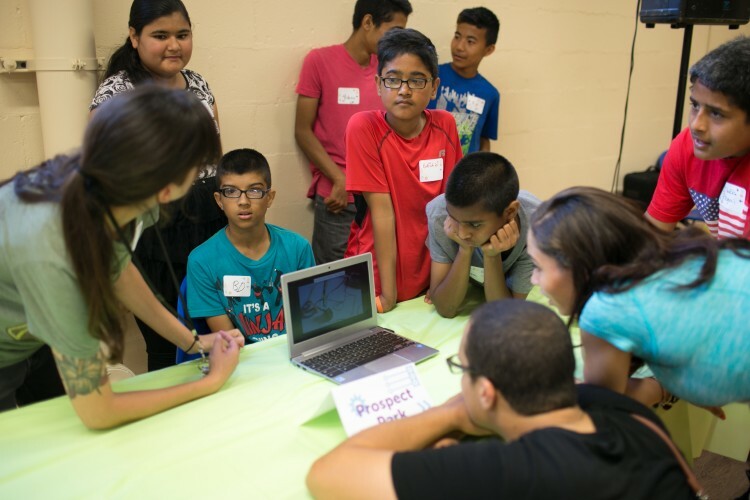 Professionals from local companies and representatives from area colleges will lead the activities making this a great opportunity for kids to meet people in the field and ask questions. The whole family can learn about the chemistry of fireworks, food, rainbows, natural dyes and more. Plus, your young scientists can experiment with fluorescence, phosphorescence and chemiluminescence. Science rocks! For a Halloween-themed science activity, try the Creepy Crawly event that’s part of the Super Science Series at the Carnegie Museum of Natural History. Free with admission, the event on October 24th and 25th will include investigating creepy creatures in the museum, trick-or-treating around the dinosaurs and hearing spooky tales from around the world. See you back here in November for more family adventures in Pittsburgh! Looking for adult events? Check out our 11 Pittsburgh events not to miss in October feature. Looking for live music? Don’t miss our Sound Picks: 10 can’t-miss Pittsburgh concerts in October feature. Posted in Arts & Culture, Family Focused, Neighborhoods, Outdoors Enthusiast, Parks.